An “email signature” is the name for a text box which goes at the very end of your emails, and is as essential as a business card these days, when email is such a widely used method of communication. 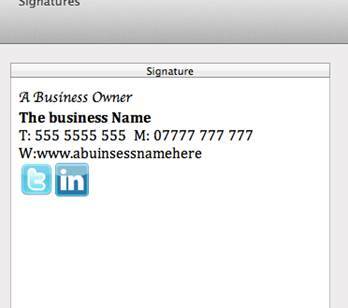 People usually create emails signatures for their business in order to put their name but also to include perhaps their business logo and important contact details i.e. their business name (or company they work for), their webpage address, their email address, their telephone number or information about the products and services you offer. Your email signature appears at the end of an email message. Each recipient of an email from you will see this information and taking only a few minutes you can create a great looking email signature in Microsoft Outlook which will automatically add to each email that you send. 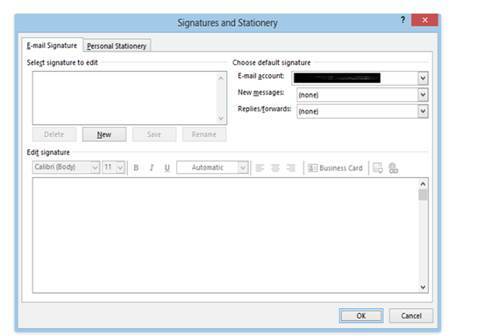 Both Office 2010 and 2013 use the same menu options, so the easiest thing to do would be to use Outlook in either version to create your signature. Previously you may have used word to create your signatures but with the functionality of the new Office versions, many people prefer to use Outlook itself. Step 1 – Firstly you’ll need to navigate to the right place to begin. You need to go to the Signatures and Stationary menu. There are two ways of getting here, both of which are relatively simple. 2. In Outlook, click on File, which will take you to the background screen in Outlook. Then click on Options, and then Mail. You should then get a screen like this. Once you see that screen, then click new to begin creating your signature. Step 2- Creating your signature can be done in one of two ways. You can choose to use the built in signature editor. This is ok but can be a little difficult to get the results you want. The other alternative is to use Word, and simply copy and paste the signature into Outlook. Doing it this way can give you more of an artistic aid, as the features in Word are generally much easier. You can add in Social Media Buttons with ease this way, and links to your website, so take some time to make your signature Social Media friendly in order to gain contacts for your business. C:\Users\%username%\AppData\Roaming\Microsoft\Signatures and then open your saved signature, fix the errors in word and then save the changes. Remember, your signature should reflect your business goals. If you’re a fun, creative company, design a signature to match. If you’d rather keep it corporate, stick to clean lines and not too much fuss.